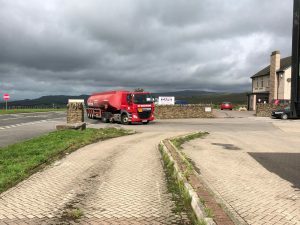 Few truckstops have the stunning views that are afforded from the Stainmore café and if you sit in the right seats, you can enjoy those scenic views of the Northern Fells while you eat! 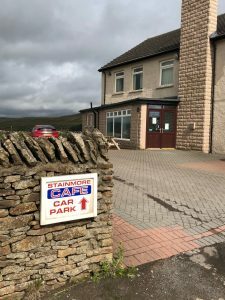 Stainmore café is on the busy A66, roughly halfway between Penrith and Scotch Corner and has always been a popular stop-off for truckers, and often used for trailer changeovers. There are five breakfast options on offer starting with the small breakfast at £4.60 which gives you two rashers of bacon, a sausage, an egg, baked beans, tomatoes and fried bread. The large breakfast is £5.10 and has an extra sausage and egg and black pudding added to the mix. For 50p more, the mega breakfast comes with two extra hash browns and mushrooms as well. Although firmly in England, the café is not too far from the border so offers a Scottish breakfast – at £5.10 – which has two rashers of bacon, Lorne sausage, egg, beans, tomatoes, potato cake, black pudding, haggis and fried bread. Finally, there is the veggie breakfast at £4.60 which is two eggs, two hash browns, beans, tomatoes, mushrooms and fried bread. All breakfasts come with either tea or coffee and toast or bread and butter. There is also a £3 kid’s breakfast with a rasher of bacon or a sausage, joined by an egg, beans or tomatoes and toast, but no drink. Extras are Lorne sausage or mushrooms at 60p. bacon, sausage, beans or tomatoes at 50p, haggis, hash brown, egg or potato cake at 40p and black pudding, fried bread or extra toast at 30p. As always, you might not want a full breakfast and there is a wide range of smaller snacks on the menu to start the day. Two eggs and beans on toast is £2.70 while two slices of cheese on toast, or two eggs on toast is £2.30. Plain baked beans on toast is just £1.90. A chip butty is £1.80 while a portion of chips is £1.60. A bowl of soup, with a roll, is £2.30. A plain burger in a bun is £2.10 while a cheeseburger is £2.30 as is an egg burger. Jacket potatoes are £2.50 with a single filling and extra fillings are 50p a go. The choice of fillings are cheese, beans, coleslaw, tuna, bacon and chicken. On the cold sandwiches and Paninis menu are bacon, lettuce and tomato at £2.50 – as is bacon & chicken. Ham or corned beef are both £2 while tuna is £1.90 and cheese on its own is £1.70. There is also a wide choice of hot sandwiches. These start at £1.80 for bacon, sausage or eggs. Lorne sausage is £1.90 while bacon or sausage with eggs are £2.10. Lorne sausage and egg are £2.30 as is bacon and sausage together. The breakfast bap – bacon, sausage and eggs are £2.80 and if you want that with Lorne sausage then add 20p. 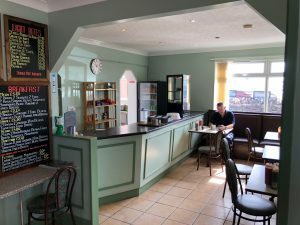 For £5.10 you can order any of the following main meals: omelette with two fillings served with chips, peas or beans, home cooked ham with eggs and chips, homemade quiche with chips and peas or beans, and corned beef with chips, eggs, peas or beans. You can add extra fillings to any omelette for 25p each, and they are ham, cheese, onion, tomatoes or mushrooms. There are also specials on offer – on the day of our visit it was mince and onion pie, with chips, gravy, peas or beans, and two rounds of bread and butter, plus a brew, for just £5. Fish fingers are £4.80, two sausages and egg is £4.60 and double egg is £4.30 – all with chips and a choice of beans or peas. All main meals come with a mug of coffee or tea and bread and butter. The kid’s menu – all priced at £3 – are fish fingers, chicken nuggets, sausage or scampi – and all come with chips and peas or beans. Chocolate fudge cake, apple pie or jam sponge – all served with cream, ice cream or custard are all just £2. 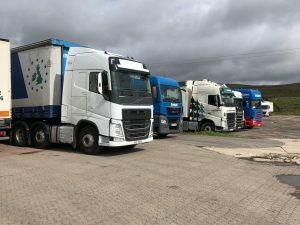 The site sells – of course – tea, coffee and hot chocolate, as well as cans and bottles of soft drinks. It also has a range of crisp and chocolate if you just fancy a little treat before you set off back on the road. The café is open Mondays to Thursdays from 0700-2000, while Fridays and Saturdays it’s 0700-1400, and Sundays it is closed. There is a TV in the café showing the news. There is an area for parking that will fit up to 50 trucks. Parking costs £10 and that gives you a £5 meal voucher, while parking only is £7 and these charges apply Monday to Thursday.The site has showers and CCTV. This café is really clean and tidy and the loos were immaculate. 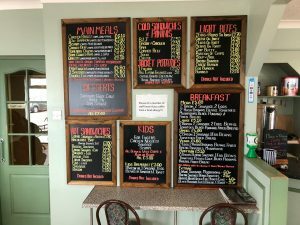 The food was excellent and offers fantastic value for money – one of the most reasonably priced truckstops I have visited in recent times. This is a good place to stop. Ok it can be a bit windswept – you will feel it when it’s cold – and there is quite a bit of traffic on the A66. But it is certainly one of the better truckstops to eat and stop over at. Thoroughly recommended.